Colonial Puritan headstones present an evolving emblematic reminder of fleeting nature of mortality, moving over time from harsh stylized eyes of judgment to the bare bones of the human skull to more humanized features before turning to images of Grecian urns or weeping willows. The images came to be known as Tombstone angels, for good reasons. Here are some examples from a burial ground in downtown Concord, Massachusetts. 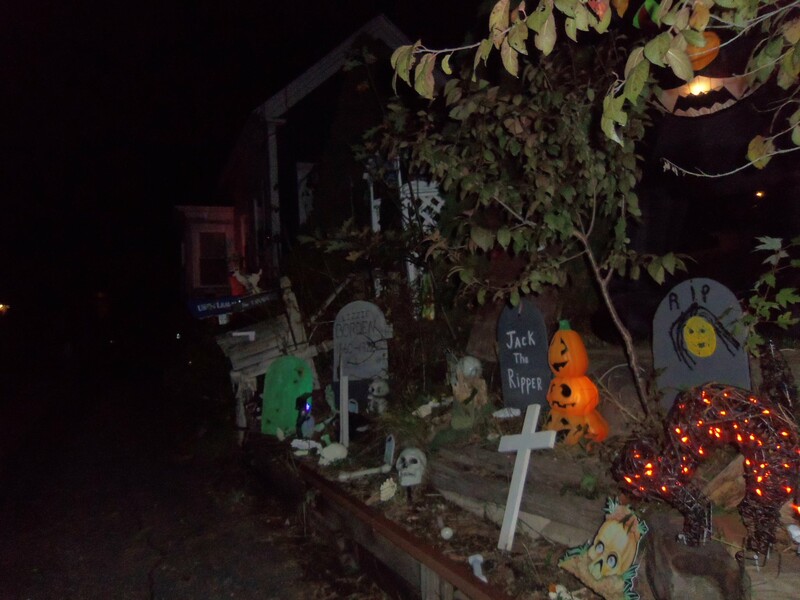 Nowhere else have I seen Halloween observed with the excess that it stirs in New England. A native of the Midwest, where I’ve lived in five cities and three states, and having resided in the mountains of both Upstate New York State and Pennsylvania, as well as in the Pacific Northwest and a corner of the South, I find myself perplexed when Halloween decorations begin appearing shortly after Labor Day, about the time that the early signs of autumn foliage are obvious and undeniable. By the first of October, the decor is out full-bore, nearly as pervasive as Christmas decorations the first week of December. 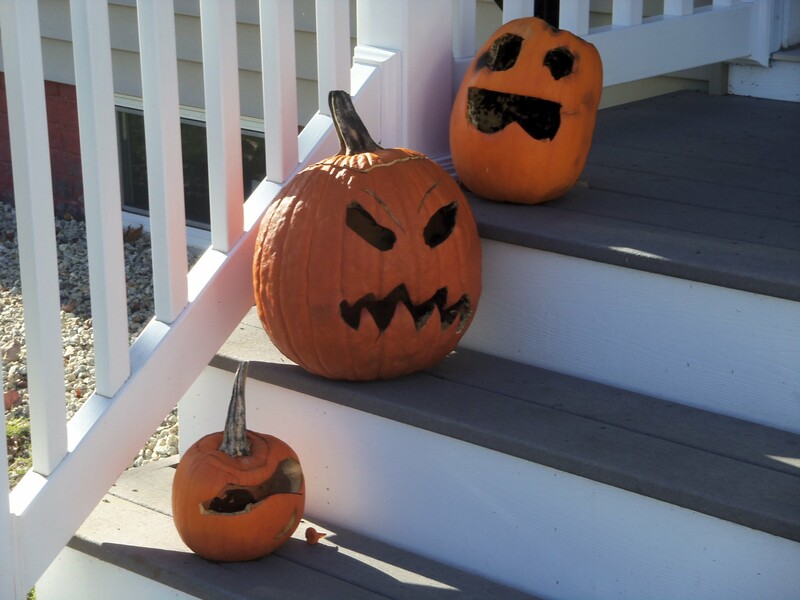 Halloween means something quite distinct here in New England – something beyond the trick-or-treat emphasis elsewhere. At first, I thought it was simply a matter of quantity – or maybe trinkets that have become widely marketed in recent years. Such observations lead me, then, to ask whether the overindulgence has accelerated in recent years. To ask whether it’s merely another manifestation of increasing consumerism – a reflection of a secular society that confuses a candy overload with spiritual blessings. But that turns the consideration toward the quality of the observance itself. Just what hunger drives so many people to adorn their yards with large plastic “pumpkin” bags filled with leaves or to drape blinking orange lights around their houses? Admittedly, some of it is pure playfulness – the effigy of the witch crashed into a telephone pole or a tree. But is there something more – a hunger within the psyche that is not openly acknowledged? In that light, the practice of teaching Halloween carols (for that’s what they are) in elementary schools can be seen as a perverse substitute for sacred Christmas music that’s been banned – a reflection of tolerance that permits the mention of witches, but not a baby Jesus, in public institutions. (Doesn’t that, by default, make for an anti-Christ? What values are being taught here? Which ones suppressed?) Hunger turned exclusively toward candy, rather than genuine food, is not healthy. Perhaps sending children out dressed as terrorists is the inevitable outcome. So what if they’ve been isolated from experiences of death common to farm life or even large families of previous centuries? My concern is that a “witches-are-good” theology sugarcoats the deeper essence of New England’s Halloween fixation. The real issue is anxiety about death, something that is rarely addressed outside of religion, which we’ve largely banished from the realm of public discourse. Enter some of the more isolated pockets of the region, listen to the stories, and you’re likely to sense that something else is going on – something that goes back generations. Bits of it appear in the news – a farmer who poisons the coffee at his church, the police chief who buries his girlfriend’s husband in his front yard and is discovered a decade later. Something in the heart turns to stone. A century-old house will do; two centuries or more is better. The fact is that families here have been in place for generations. Memories linger, and wounds – even perceived slights – fester. Add to the caldron large numbers of Scots-Irish, Irish, and Quebecoise – with all of their own folklore and superstitions regarding death and hardship. Salem – the city now synonymous with witchcraft in America – is also the seat of Massachusetts’ Essex County. From our contemporary vantage, we typically blur Salem in with “events back then” and overlook just how far back that goes (settled in 1626, it’s the second-oldest city in Massachusetts – and four years older than Boston). By comparison, Philadelphia would not be envisioned until 1681, and the first town in North Carolina would not be founded until 1705. Salem bridges more than the mother country’s Essex County with an Essex County in the Massachusetts Bay Colony. Despite its footing in medieval thought, barely a decade after its founding Salem could nevertheless as easily claim to be the birthplace of dissent in America, thanks to a succession of Samuel Gorton, Anne Hutchinson and her followers, and Roger Williams in the 1630s – each of them, we must note, ultimately taking flight to what would become Rhode Island. From our contemporary vantage, we also blur the distinctions between the Pilgrims of Plymouth Colony and those of the Puritans who established the Massachusetts Bay Colony – not only critical theological differences, but cultural ones, as well, rooted in different parts of England. Our modern impression of witches in black pointy hats and Puritans with muzzleloaders and buckled hats loses any sense of the intellectual and moral fermentation in the decades up to 1692 – a time of upheaval that included the theological and social challenge presented by the emerging Quaker movement (four of its itinerant ministers were executed by Massachusetts officials 1659-1660) and by the simultaneous restoration of the English monarchy. The return of Charles II to the throne must have presented the ultimate existential conundrum to the Puritan movement, which had come to the New World with hopes of nurturing the future English government from exile and was then largely excluded from Oliver Cromwell’s Protectorate. All the while, the expectation of Harvard University as an alternative Oxford would, over the centuries, would be fulfilled in a then-unanticipated destiny. Today we emphasize the Puritans’ fear of nature, but overlook the fact that the frontier wilderness not far from their doors was full of danger – including kidnapping to Quebec that continued until the end of the French and Indian War in 1763. Until then, English civilization ceased just beyond the handful of garrisoned communities only sixty miles up the coast from Salem. While we today apply “Puritan” or “Puritanical” with a prejudicial contempt equivalent to the charge of “witchcraft” or “sorcery” in earlier eras, we also fail to see the movement’s great idealistic accomplishments, including genuine attempts to create utopian societies within the constraints of human nature. We fail, too, to see that they maintained – even from their pulpits – a lusty approach to life and sexuality, albeit within the confines of marriage and community. We expect them to be spotless, by our standards; what a shock, then, to hear about the large quantity of beer these Puritans quaffed – more than a gallon a day for every man, woman, and child, by some estimates – and, later, hard cider. (Or, on much of the New England frontier, the whiskey common to Scots-Irish tables.) Even watered down, it must have led to borderline alcoholics, at the least. A paranoia becomes possible. What is missing in our stereotypes, then, is any sense of individual people and their personalities. Nowadays, we revel instead in their failures and discipline, instead of their accomplishments and goals. In raising the “puritanical” cry, we blame them for much in which they are guiltless, and accuse them of things they never were. We are far more likely to look at them through the revisionist eyes of Arthur Miller (The Crucible) or Nathaniel Hawthorn (The Scarlet Letter or The House of the Seven Gables) than through their own. The sins, then, may be ours as much as theirs. The subject of witchcraft obviously provides its own boogyman – especially as it touches our own nerve about persecution injustice. (Incidentally, one friend has concluded that the Salem witch executions were the result of the application of then-modern “scientific method” jurisprudence; under church rules, she argues, none of the accused would have been ruled guilty. Again, our presumptions and values deserve challenge.) What is not known can be regarded as darkness, and who knows what lurks in the darkness? All the same, something in autumn evokes witches in the American mindset. 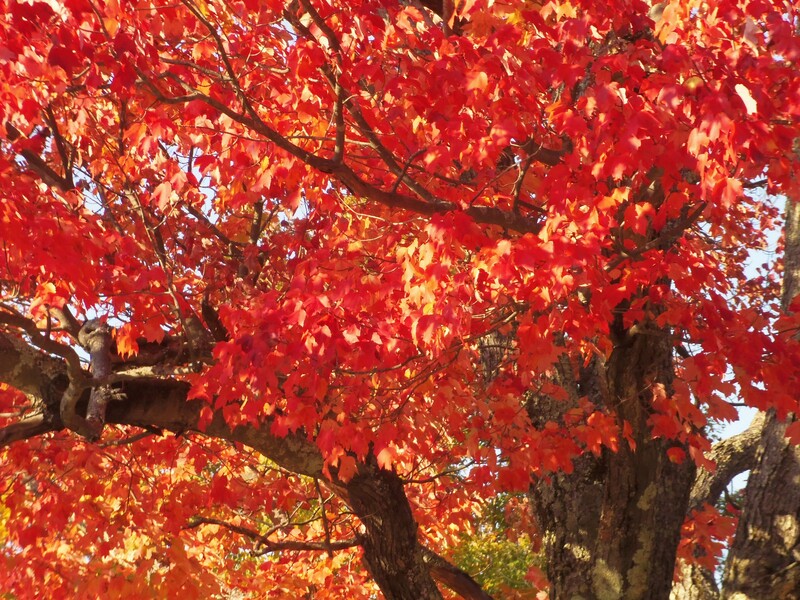 Especially in New England, with its intertwined images of fall foliage and Halloween witches. As Fischer notes, from 1647 to 1692, the Puritan colonies accounted for ninety percent of the accusations and eighty-five percent of the executions for witchcraft in English-speaking America. If we typically fail to see the Puritans themselves, perceiving witches becomes even more elusive. (And all the more fascinating for a modern thread of morbidity.) We can ask, of course, whether they existed at all. One answer is that laws are not written and imposed for problems that don’t exist. In other words, “Where there’s smoke, there’s fire.” Of course, there’s the very question of how witches and witchcraft are defined – and even whether practitioners would have so defined themselves or their work in that manner, or as something quite different. On top of it all is the romance of the outsider – an underground tradition, perhaps dating to antiquity, maybe Druids or Celts, or the mere act of quiet rebellion against the dominant authority. What we do see is how much the matter haunts the American mindset, and how widely it touches a common nerve. Nothing demonstrates this as much as the autumn pilgrimage to Salem amid the annual tide of foliage peepers. While the Salem witch trials touch on many basic tensions – with socio-economic justice high on the list – they also invoke an underlying tension between intellect and emotion. Because the Puritan strand of Calvinism relied strongly on the Bible as the “written Word of God,” what emerged was a reason-based approach to faith. Where, then, did emotion fit? Or practices that long predated the Protestant Reformation? Or abuses of power relating to families and commerce? Buried emotions and fears were bound to erupt somewhere. In some ways the contemporary New England Halloween seems to wallow in the forbidden, a Mardi Gras in Pilgrim land. How strange, too, that a holiday from the Catholic and Anglican liturgical calendar should come to so dominate a place settled by those who did not observe even Christmas! How much, then, is a jeering reaction to the Puritan hierarchy from East Anglia by the Scotch-Irish, Catholic Irish, and backcountry Quebecoise who since migrated to the region in great numbers? The witch trials continue to fascinate as historians delve into not-so-apparent influences, such as struggles for secular dominance and wealth. Some see a manifestation of long-festering Puritan fears, an anti-Quaker thrust of the Salem trials, though veiled, having much earlier hanged Quaker Mary Dyer, a woman having a legitimate claim to the throne of England. Even earlier, Salem had offered a pulpit to Roger Williams, who would eventually establish the first Baptist congregation in America, and was a center of antinomian theology, much to the agitation of Puritan officials. The ultimate issue, then, may have been Puritan hegemony, rather than witchcraft. Others have looked to scientific causes, such as an outbreak of hallucinogenic ergot in rye – which would nonetheless point back to the fears of witchcraft itself. When considering Halloween in New England, we might even add the much-later Lizzie Borden case (1892 – exactly two centuries after the Salem witch fever), that continues to focus a morbid fascination on Fall River. Lizzie’s case is mirrored in other stories of death, of a series of husbands slain by their new bride, of children’s mummies found in attics decades later, all part of New England’s Gothic lore. Somehow, it’s altogether fitting that master horror writer Stephen King lives in Maine. Within that collective unconscious memory is the fact that Halloween falls close to the beginning of solar winter, just a little more than a week away – just as Groundhog’s Day announces solar spring. This sense of solar seasons, rather than calendar seasons, is well known to earlier peoples, and explains why Mayday, the beginning of solar summer, was so widely celebrated. (Except in New England, where the town of Merrymount provided the brief exception.) Such arcane knowledge makes pieces of folklore fit into place. Halloween is a harbinger of November, the bleakest month of the year – made all the more so by the return of Eastern Standard Time, which drives sunset to mid-afternoon and means leaving the workplace for home in darkness. Halloween, then, is a herald of gloom, death, and despair. Laugh all you want during the party or the parade of sweet-toothed kiddies, the candle in the jack-o’-lantern will die out. Here, then, autumn presages new trials. The brilliant colors are deceptive and short-lived – a clarion warning. Getting through New England’s dark winter has no guarantee. Don your costume and pretend it does. But for balance, remember, All Saint’s Day and Ash Wednesday follow – with much reason.